You know that I love my cast iron skillets. I won’t bake up cornbread in anything else, but they are useful for so many other cooking jobs as well. Once you’ve built up a nice bit of coating on them, they cook better than any non-stick pan. 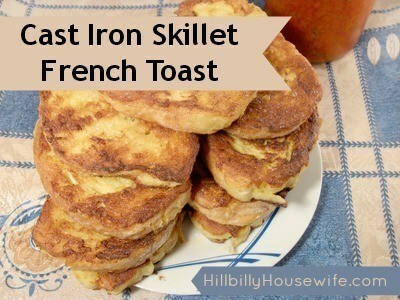 Today I’d like to share my recipe for Cast Iron French Toast with you. It’s from the Hillbilly Housewife’s Cast Iron Cookbook. If you have never made french toast in a cast iron skillet, please give it a try. The even temperature gives it a wonderful little crust that’s hard to replicate in any other way. In a large, shallow bowl, mix together eggs, milk, cinnamon, and vanilla until well combined. Warm cast iron skillet over medium-low heat. Lightly grease with butter. Dip pieces of bread one at a time. Immerse and coat both sides. Don’t soak too long or it’ll get soggy and fall apart. Just dip it briefly so it gets immersed. Soak only as many slices as you will be cooking at one time. Place the soaked bread in the greased skillet. Cook the bread on both sides until a light golden brown. Arrange the cooked French toast on plates and dust with powdered sugar. Add syrup to taste.